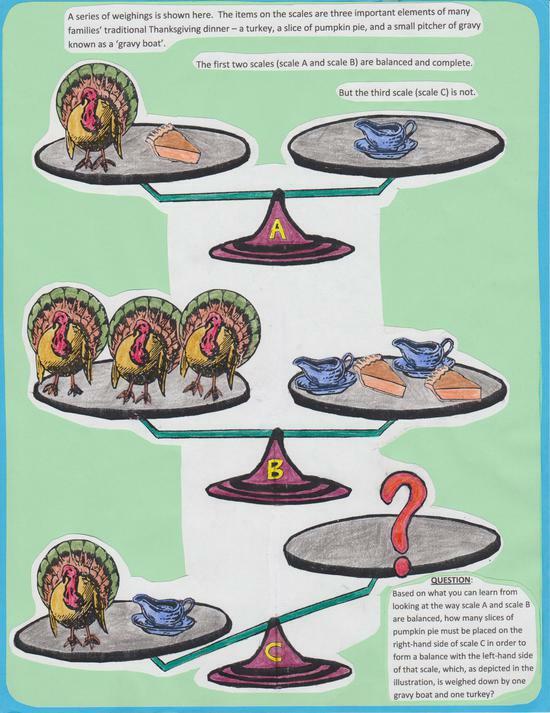 Would it be possible to repost the Thanksgiving Day puzzle you posted a couple of years ago? It was the one with the pictures of balance scales with turkeys on them. I teach middle school and high school math classes, and it was very popular with my students. Of course! We have had numerous requests for that one (as well as the other balance scale problems we will soon be posting for other upcoming holidays). And so. . . Here it is! I hope your students enjoy it! And keep an eye out for the solution, which we will post before schools break for Thanksgiving.